Hard to believe (or is it?) that I've been listening to Chris Isaak for 30 years. His debut album came out in 1985, and I got it after seeing him on Friday Night Videos. ....because I liked the music and he was dreamy. Deep down, his music hasn't changed all that much and he is still dreamy. He has a new disk out as of two weeks ago - First Comes the Night. For an extra $2, I got the DE-luxe model which has five more songs. I'm a marketer's dream. They see me coming a mile away. Isaak certainly has a style, and while he's tweaked it here and there, it's never far off course from his origins. And while so many reviewers want to brand him as "an Elvis" and there is some of that here ("I Love the Way You Kiss Me"), but he is so much closer to "a Roy Orbison", yet still his own artist, his own style. Recording in Nashville and using that cities musicians, it is hardly a "country" album, though Rolling Stone reviews it as such. But they are kind of idiots anyways. I will say there are other influences ("Running Down the Road" - Jerry Lee Lewis, but mostly the keyboards, not the vocals). Like all Isaak albums, First Comes the Night is fraught with heartache, loneliness, melancholy - everything that Isaak is known for. As always most of it works, some of it doesn't. Well, about half of it works. I love the title track - though when he sings 'wherever you are' followed by 'you're here in my....' I always assume he'll say 'car', because it rhymes more than 'heart' does. Weeks later, and I'm still going with 'car'. Most likely, the best song is "Reverie". Sure, it starts out with the piano from the Lisa Kudrow show, Web Therapy (which possibly stole it from Suzanne Vega's "Pornographer's Dream"), but it is the song I enjoy most on the disk. And oddly, the "bonus" tracks are good. Normally, artists who don't have them on the standard album, they tend to be throwaway songs. But four of the five are better than some stuff on the normal disk. There are things here that don't work - in my opinion: "Baby, What Do You Want Me to Do". The plucking of violin strings seems out of place, but the vocal arrangement seem to compete with the musical arrangement. "Insect" is not bad, but it is not over the top good. While I appreciate Isaak trying to shake things up with the Nashville routine and normally I'd say maybe working with other songwriters strays from who he is, but all the songs I like were co-writes. Maybe the need for three producers made the album less cohesive, I don't know. 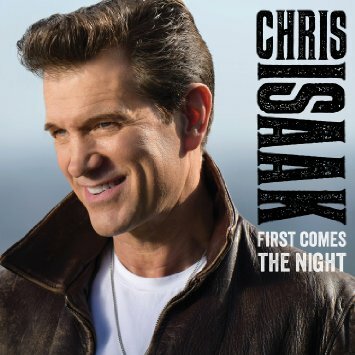 Don't get me wrong - First Comes the Night is by no means a bad disk, but it is not Chris Isaak's best work either. And I get Elvis, and now, thanks to Blobby, a little Roy, but with a hint--perhaps in the dreaminess--of Ricky Nelson.